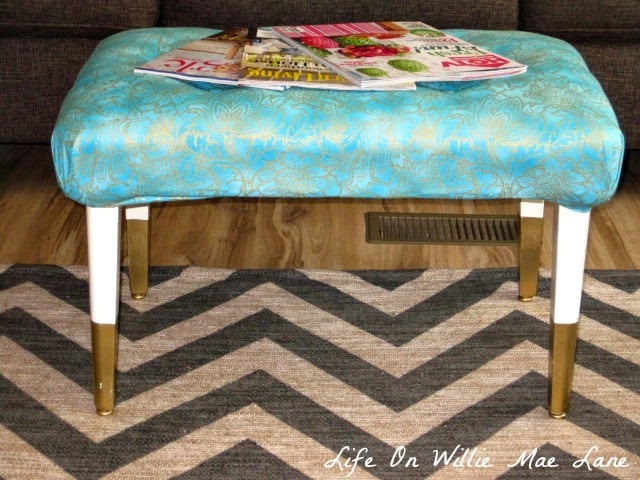 Love the great color the ottoman adds to your room. Everything has tied together beautifully! I went over to see your classroom, WOW!! I would love to be young again and have you as a teacher. You sure did work hard, my my. Those sweet kiddo's are blessed to have you as their teacher. Love it all! 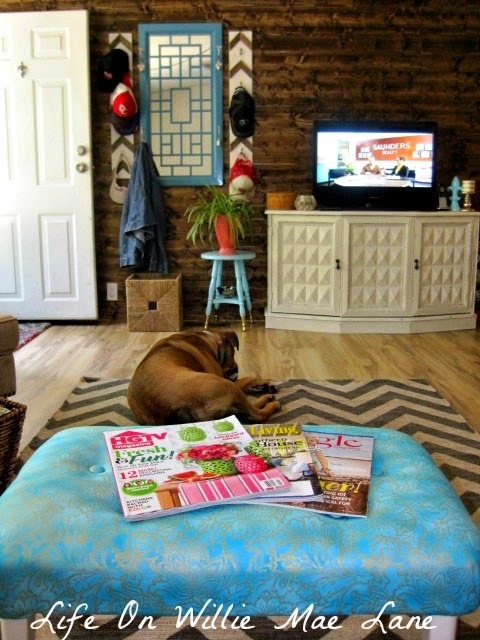 I want that sofa!! It's what I'm looking for! Just love the pops of color! You and your hubby have done an amazing job with your make over! Very classy those gold-dipped legs. Put up a before and after of the room so we can see the big difference. You and Joey did a wonderful job. Until then.... Have a wonderful day! The renovation looks amazing Vicky. I am so excited for you. 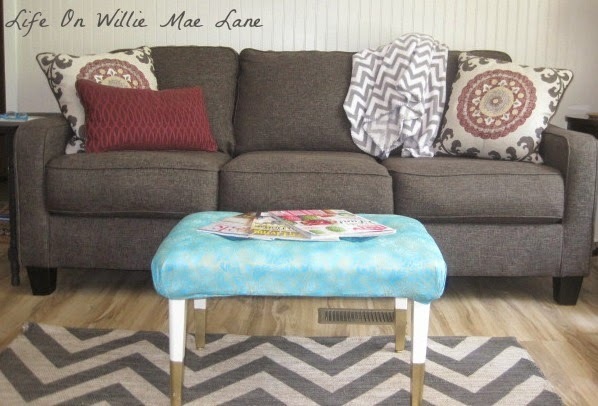 I love the ottoman. Can't believe how beautiful the fabric is and you did a great job on the tufting. I've never tried anything like that but it add a bit of sophistication to it. Love how that looks! 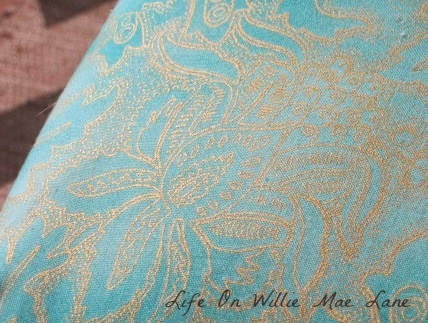 I'm just a bit obsessive about turquoise and this fabric is gorgeous. You must be an awesome teacher Vicky! 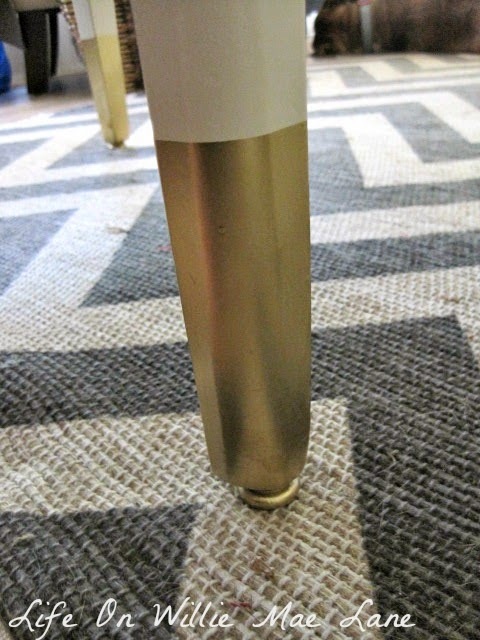 Love the gold dipped legs on that chair. Tres chic! It's so pretty, Vicky! The fabric is just awesome! Oh and I like your entryway area. Good idea to create a space. Everything is coming together nicely. Looking forward to your blog land tour! Oh my goodness, this is fabulous!! Every time I see something you do I think it's my new favorite from you. . .well, this is being added to my favorites by you :) You are amazing, Vicky! I am in love with your gold dipped legs! 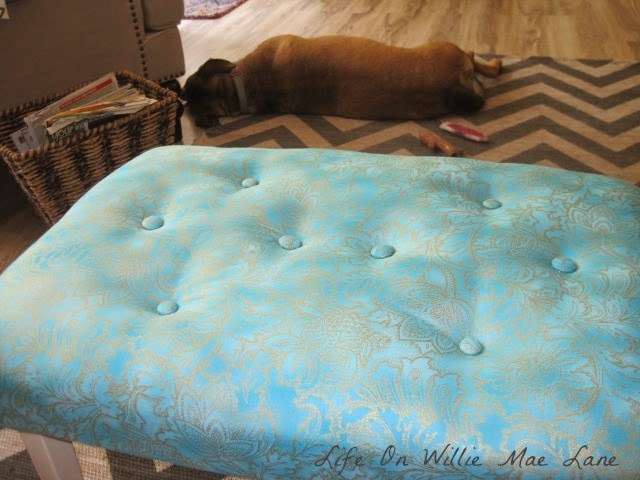 You did an amazing job on that ottoman as tufting is not an easy task! Love the view! !